For someone who thought he had put school in his rear-view window permanently, Ben Davis hardly hesitated a moment before enrolling in the Nash Academy of the Animal Arts in Kentucky. A lifelong lover of animals, Ben drove big rig trucks for a decade before asking a friend how she learned to become a dog groomer. When she responded "The best school in the nation" something clicked for Ben. He may have been attracted to the relatively quick 4 month program, but he certainly got more than a certification at Nash. In addition to grooming techniques, he learned about dog physiology, psychology and nutrition. It was there he heard about a researcher studying the DNA of dogs in comparison to their wild brethren, wolves and coyotes. 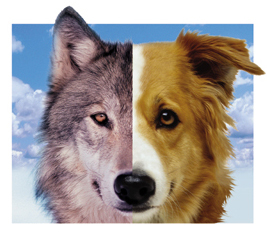 The finding that domesticated dogs and wolves share 99% genetic similarity helped shape his view of our canine companions. After graduating he roamed the West a bit longer before hearing about a small business opportunity in Idyllwild. The tiny grooming room behind a pet food store expanded to a boarding facility and eventually a multi-building complex including a kitchen, where Ben developed the product he now says will be his life's work. After talking to other professionals feeding their dogs with the building blocks of a wild canine diet - raw meat and bone minerals - he tried it on his best friend and travelling companion Nekko, who had been suffering from a skin disorder. After several months his vitality improved and the skin problem completely reversed.Grooming and boarding clients, impressed with the breadth of his knowledge eventually started asking him to make food for their dogs as well. Ben is no fly-by-night fad product opportunist. A conversation with him about dogs quickly reveal the depth of his personal experience and research. Living with and observing an ever-rotating canine pack for 8 years has certainly played a role - he's watched the physical effects of many kinds of pet food consumption over the life span of his long term clients. The Monarch Raw Diet emerged primarily out of a desire to see the pets he cared for thrive.He also wants families he worked with be able to afford the food he truly believes is the right fit for an animal that may have changed its behavior, but not its genetic makeup. If you love dogs, set aside some time to chat with Ben - you'll walk away with an education. The Monarch Raw Diet is now available at all 3 CFMCV's - he'll be in Palm Springs for the first time this Saturday. For those of you who've bemoaned the absence of mushrooms in the Market over the past season, now is the time to rejoice! Nest Farms, our friends from Anza, previously brought a lovely variety of edible fungus from their partner farm in Riverside, Bih Shan Farm. When that collaboration discontinued, those of us with a hankering for umami went into mourning. Mario and Sara are the ultimate farmpreneurs - they'll try to grow just about anything if they think customers will enjoy it. They knew we wanted, nay, NEEDED our 'shrooms. But mushrooms are shall we say, particular, about their surroundings. They need special soil, warmth and lighting. That means construction. Undeterred, they plunged into the challenge with vigor. And over the last few weeks we've seen the fruit -er- spores of their labor. 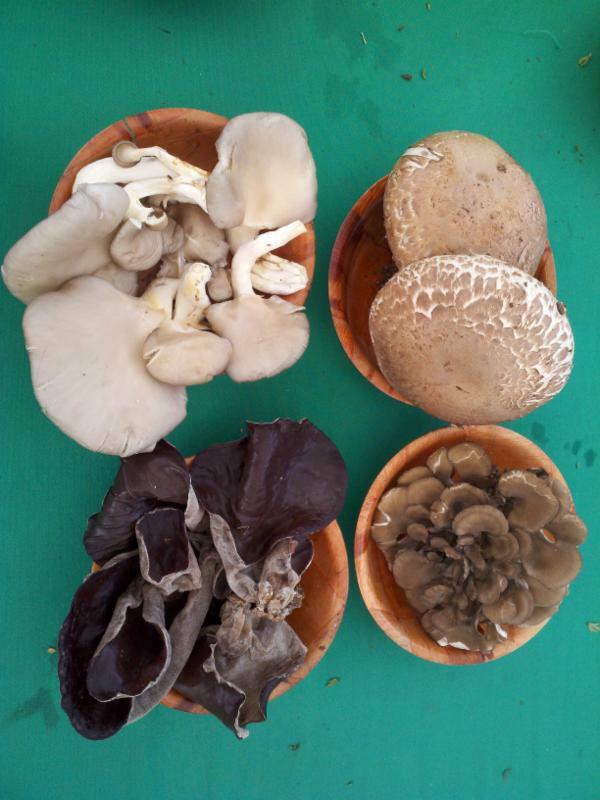 Customers at all 3 Markets can now purchase Portabello and Shiitake mushrooms fromNest Farms every week, and Cremini and Woodear should follow soon. Make 'shroom in your shopping bag this weekend! You know how it feels when you make a new friend who seems to share all your top interests and passions? Usually you try to engineer your schedule so that you cross paths with that person as often as possible. That's kinda how we feel about Chef Daniel Villanueva from Balisage Bistro. After his appearance in January as our Guest Chef in Palm Springs, he's become a weekly fixture at the PSCFM - shopping for the restaurant from a wide variety of our farms and vendors. His enthusiasm as he bounces around the Market in his chef togs is as contagious as the flu, but with much more positive side effects. 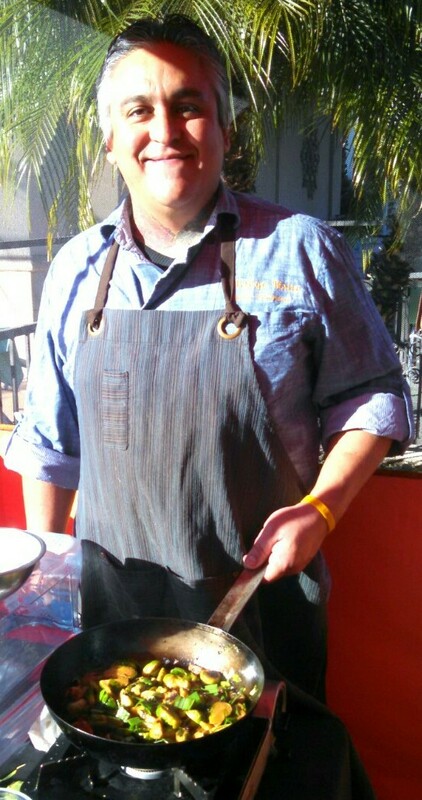 We're happy to announce that Chef Daniel will be in our cheery orange Guest Chef booth again this Saturday, shining a balisage light on our farms and their seasonal best (the word is tomatoes will be a featured ingredient). He'll also be stocking up for a 5-course wine dinner at the restaurant next Wednesday, February 25th. Feel free to quiz him about it under the canopy tomorrow, or call the restaurant for more info: 760-406-4565. The Palm Springs Cultural Center is a 501(c)(3) non-profit organization, which was established to encourage the development of the cultural arts in the Coachella Valley with a specific focus in the areas of film, fine art, live performance, dance, music, and community festivals. The Center is dedicated to advancing education, to nurturing community-wide participation in the cultural arts, and to sponsoring scholarship awards for deserving individuals.